Lily Blackwood brings the medieval highlands of Scotland to life in this third book of her Highland Warrior series. Readers may have had to wait longer than expected for Cull's story but, oh, this story was so worth it. Cull the Nameless, King's Guard and knight of Scotland has no memory of his life before the years spent as a ship's slave. What he does know is that at the age of twelve, he was purchased by the Earl of Buchan, fed, clothed, named, and trained to be a warrior. All that Cull is today he owes to Buchan and he proudly serves him as a commander of his soldiers. 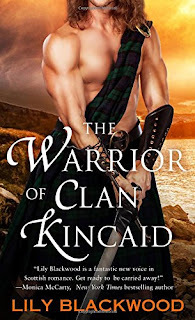 Which is why he is currently leading a force of those soldiers to demand the surrender of the Laird of Clan Kincaid and all his properties or take them by force if necessary. For her own safety, Derryth McClaren, pampered sister of the Lady Kincaid is secreted away from the Clan Kincaid castle in the middle of the night to make the two day journey to her childhood home. Plans go awry when their party is attacked and they find themselves taken prisoner by Cull but the warrior is not what Derryth expects. Rather than the evil person she anticipates, being loyal to Buchan, she encounters an honorable man. The more she comes to know him, and sees evidence of his fair treatment of her and those who traveled with her, the more she believes he's not aware of just how evil his lord is or that he may be using Cull to carry out his own personal revenge in the most devious way possible. Cull has no knowledge of Derryth's connection to Clan Kincaid. He also has no idea of the truths Buchan has kept from him nor the lies he now tells in his obsessive quest to destroy the Kincaids. He only knows he has fallen in love with a woman who is stronger than she realizes and his perfect match in every way. But there those who will do anything to keep Cull and Derryth apart and one more truth to be told that will change everything...and everyone...in unimaginable ways. Cull and Derryth are characters who engaged my heart, my mind, and my romantic soul. Their bond is so deep, so complete that I was certain their love would conquer any obstacle in their way...and Blackwood throws more than a few obstacles in their path. With this book, and the two that preceded it in the trilogy, Lily Blackwood has earned a place among my favorite medieval romance authors. Her characters are fully dimensional, with depths that draw me in and encourage me to cheer for their happy endings...or just punishments, as the case may be. Her words paint pictures, allowing me to visualize life in the highlands as it would have been in 1390. And her storytelling brings me along on a sometimes emotional, sometimes frightening, sometimes sensual, and, ultimately, celebratory journey that I feel like I'm experiencing with the characters. I don't read about their journey, I journey with them, and that's what a good book should do. If you have not yet discovered Lily Blackwood, I highly recommend the three books in her Highland Warrior series: The Beast of Clan Kincaid, The Rebel of Clan Kincaid, and The Warrior of Clan Kincaid. I don't know if Blackwood plans to return to this world but there's a secondary character in this series who has proven his worth and deserves a happy ending. I'd like to go on record with my wish for a story for Robert and if that story could include the Kincaids, all the better! Hello! That's a cover! And in a time period I prefer my Scottish novels. I haven't read her yet. PUTTING HER ON THE LIST RIGHT NOW! Awesome. Hellie, this series is right up your alley. Each of the three books can stand alone but they're much better if read in order. A new Author for me. This series is going on my TRL. Love my Highland books. Hope you enjoy this trilogy as much as I have! I've not read her as yet but sounds like something I would enjoy - thanks! I've really enjoyed this series. She's also published regency historicals as Lily Dalton. Thanks for the lovely review of Lily's book. I have read the first two in the series, and plan on reading this one. I loved the first two, Diane but I think this third one is the best one yet. Hope you like them, Alina! I have read this book, and everything you say is absolutely right on point. Cull and Derryth are wonderful characters. I have not read the first two books in the series and this works as a stand alone. Oh, you definitely need to read the first two books as well, Annette. They're all so good! Also, several people online have been asking for Robert's story and Blackwood says it's a possibility! The cover is enough to draw me in. I have not read any of her books. I will definitely add this to my TBR list. This was my first book by this author and like you I fell in love with Cull and Derryth. I was asked to read and review by its publisher, St. Martins Press. I now plan to read the first two books in the season, because I loved the writing so much. Thank you for your review PJ. I need to get to know this author. Medieval Highland stories were the first romances I read and are still favorites. This one sounds like it has all the factors that attracted me to the sub-genra. I will be looking for this series.